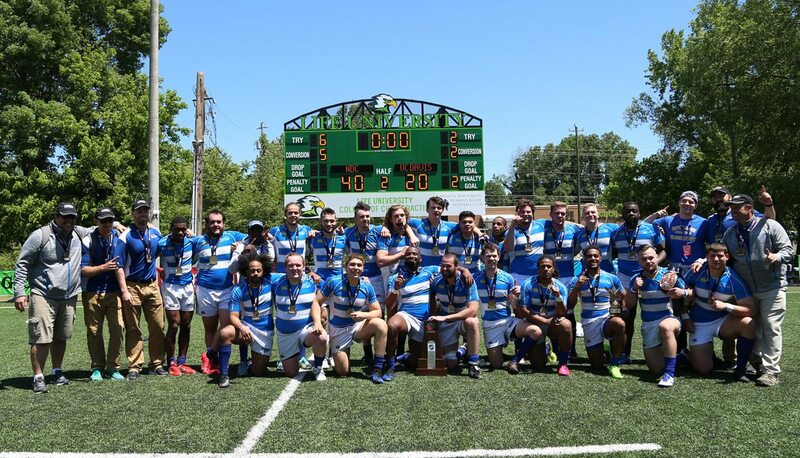 MARIETTA, Ga. - Notre Dame College scored five tries in the second half of Saturday's Men's D1AA National Championship Final to end University of California, Davis', two-year run atop the division, 40-20. The first title game at the 2017 USA Rugby College 15s National Championships at Life University featured two schools also competing against each other for a Women's Division I Spring Championship, which will kick off at Lupo Family Field at 3:30 p.m. ET. The tournament is being broadcast live on The Rugby Channel. Davis enjoyed possession through the first 20 minutes as the Falcons found themselves on the wrong side of the match official's whistle for ill-disciplined play and sloppy ball-handling. An attempted fourth-minute clearance in front of his own posts saw full back and eventual Most Valuable Player Marcus Tupuola kick straight into teammates at the gain line for an offside call. Aggies fly half Joshua Farnsworth made no mistake from in front for an early, 3-0, lead. Farnsworth doubled the lead midway through the half as Davis kept the ball in the attacking part of the field. Lengthy defensive stands led to a diving over penalty around midfield a few minutes later, giving the referee no choice but to send Notre Dame lock Matthew Smith to the bin for 10 minutes. Those 10 minutes were the best of the half for the Falcons, however, and a 35th-minute try to inside center Zack Forro put them ahead, 7-6. They killed off the remaining time on Smith's sinning and took the slim advantage into the break. 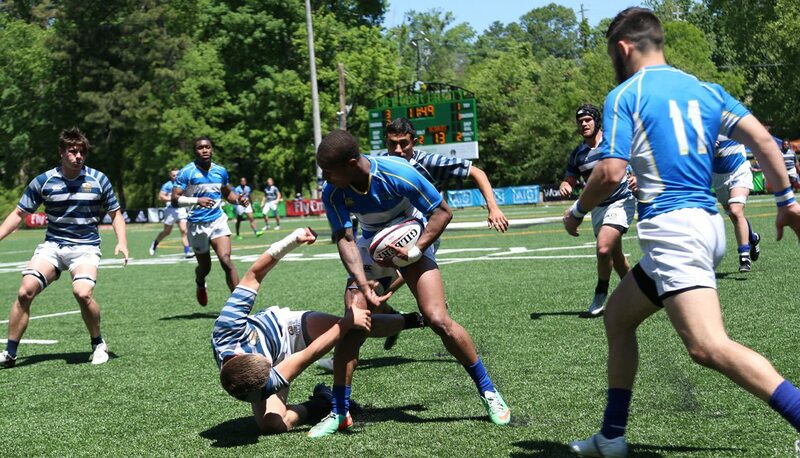 A more even-keeled opening 10 minutes of the second half gave Notre Dame some momentum, passing the ball in contact and otherwise for the type of running rugby that knocked off several D1A Rugby teams this season. After an initial foray behind the 22 was turned over in the 51st minute, prop Khalid Williams dummied and fended a defender for an offload to fly half Cory Graham. After stepping two defenders, he popped the ball out to Forro at the try line for the center's second try of the game and a 14-6 lead. Farnsworth was unable to send a 57th-minute penalty through the uprights to draw within an unconverted try, and Notre Dame ensured the Aggies would not get closer without its say-so with a try three minutes later. Smith broke a tackle to pass the 22 and Tupuola sent a skip pass in contact out to Charles Winn along the touch line. The wing kept out of one tackle and beat the final defender to extend the Falcons' lead to 19-6. Despite Inoke Raikadroka finishing off an attack in the 67th minute to bring the Aggies closer at 19-13, Davis' leisurely play from a deep Notre Dame kick saw a looping pass intercepted by RoNeil Reynolds for a 69th-minute try. A well-worked break from the ensuing restart found the ball in Tupuola's hands in stride, and the full back accelerated past the defenders along the touch line to dot down, 33-13. A kick outside the Notre Dame 22 sailed directly into touch for a useful Davis lineout. Though they lost the ball forward on the wing with space ahead, an advantage was being played to the Aggies, and Dominic Burke took the ball over the try line from the five-meter quick tap. It was too late for a comeback, however, and Graham put the finishing touches on the Championship with a slick run from 40 meters for a 40-20 final score.